Itch and pain have a complicated relationship. Pain can suppress itch, and yet itch seldom suppresses pain; in fact, some itchy substances also cause mild pain. Now, researchers led by Xinzhong Dong, Johns Hopkins University, Baltimore, US, show that a small subset of spinal interneurons in mice can trigger both itch and pain, depending on how intensely this population is activated. The investigators find that these neurons, which contain gastrin-releasing peptide (Grp), respond to both painful and itchy substances, but they do so more vigorously to the former than the latter. Consistent with this “intensity-dependent coding,” chemically activating Grp neurons caused mice to scratch and lick themselves, behaviors associated with itch and pain, respectively. “The paper is a real tour de force,” said Steve Davidson, University of Cincinnati, US, who was not involved in the study. Researchers had largely dismissed the theory that the intensity of neuronal activation codes for itch versus pain, Davidson added, owing to previous work on peripheral neurons. “The big message here is that this idea has been given a new life,” he added, at least in the context of the spinal cord. Surprisingly, Dong and colleagues also find that strong activation of Grp neurons suppresses pain-related behaviors. They propose that a circuit featuring Grp neurons forms a “leaky gate” that allows only itch and weak pain signals to pass through; the gate shuts in response to strong pain signals, thanks to the workings of endogenous opioids. The findings were published February 22 in Neuron. In 2013, Dong and colleagues showed that a small collection of C-fiber “nociceptors” do not, in fact, trigger pain. Marked by their expression of Mas-related G protein-coupled receptor A3 (MrgprA3), they are instead dedicated to itch (see PRF related news). Building on those findings, co-first authors Shuohao Sun and Qian Xu, along with colleagues, searched for the next node in this itch circuit. They knew that MrgprA3 fibers mainly innervate lamina II of the dorsal horn but were unaware of the genetic identity of the neurons onto which they synapse. The researchers screened a number of transgenic mouse lines, each of which labeled a subset of cells in the spinal cord dorsal horn. Ultimately, the population expressing Grp, also restricted to lamina II, was the most promising candidate. Since few neurons in this layer project to the brain, the investigators reasoned that this Grp neuron population mainly consisted of interneurons. To test whether Grp neurons indeed received input from MrgprA3 neurons, the authors optogenetically activated the central terminals of MrgprA3 neurons and recorded excitatory currents from Grp neurons in the spinal cord. All 16 neurons from which they recorded showed excitatory responses, revealing that MrgprA3 and Grp neurons formed monosynaptic connections. Using monosynaptic rabies tracing, the researchers found, however, that Grp neurons also received input from nociceptors expressing the transient receptor potential vanilloid 1 (TRPV1) ion channel. That led them to ask if Grp neurons could code for both itch and pain. To find out, they tested if and how these neurons responded to substances associated with either pain or itch. The authors recorded from Grp neurons in spinal cord sections with attached dorsal root ganglia (DRG) and their central terminals, while applying a host of chemicals directly to DRG cell bodies. In response to capsaicin, a chemical associated with burning pain, Grp neurons fired, and did so rather strongly. But with several itchy substances, including histamine and the antimalarial drug chloroquine, they showed far weaker responses. While these findings hinted that Grp neurons encoded itch and pain, specifically through the intensity of their activation, there was a second possibility. These neurons might receive input from MrgprA3 and TRPV1 neurons, but only give rise to one sensation or the other. This was the case in a previous study from Dong and colleagues, which found that MrgprA3 neurons only triggered scratching, despite responding to capsaicin, high heat, and strong pressure (see PRF related news). So the researchers chemically activated Grp neurons by administering intrathecal capsaicin to transgenic mice with TRPV1 expressed only in these cells; elsewhere, TRPV1 was absent. In contrast to wild-type and TRPV1 knockout mice, these animals both scratched and licked themselves. “It’s safe to say that Grp neurons encode itch and pain information,” said Davidson. “It’s still possible that somewhere further on in the spinal cord or in the brain there are areas more selective for one or the other,” he added. Dong, however, predicts that intensity-dependent coding is also a feature downstream in the circuit. Such third-order neurons may include those carrying the receptor for Grp, located in lamina I of the spinal cord (Sun and Chen, 2007; see PRF related news). “My bet is that if you turn them on, the animal will behave just like when we turned on Grp neurons,” said Dong. The researchers went on to explore the relationship between the level of Grp neuron activation and each of the two sensations. With higher doses of intrathecal capsaicin, mice possessing TRPV1 solely in Grp neurons showed more intense scratching. But for pain, the activation-behavior relationship was different. Mice instead showed the most licking at moderate doses of capsaicin. In other words, with strong enough activation, Grp neurons seemed to suppress pain. But how? Dong and colleagues wondered if endogenous opioids might be involved. When they intrathecally injected naltrindole, an antagonist for the delta opioid receptor, along with a high dose of capsaicin, mice licked themselves to a greater extent than with capsaicin alone. This suggested that enkephalin, the endogenous ligand for the delta opioid receptor, was responsible for the pain suppression. As for the source of enkephalin, the researchers found evidence that Grp neurons activated nearby interneurons, which release the neuropeptide. According to the researchers’ leaky gate model, the newly identified circuit, made up of Grp and enkephalin neurons, functions like a brake, preventing strong pain signals from reaching later stages of sensory processing. Another way of looking at it, Davidson said, is to think of Grp neurons as having a safety valve. Gate Control Theory Springs a Leak. Neuron. 2017 Feb 22; 93(4):723-724. 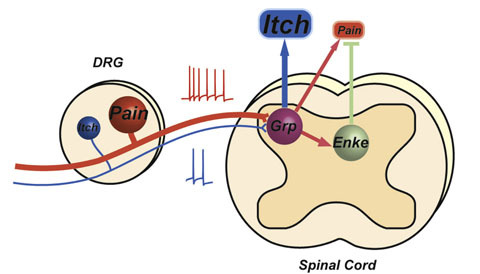 Leaky Gate Model: Intensity-Dependent Coding of Pain and Itch in the Spinal Cord. Neuron. 2017 Feb 22; 93(4):840-853.e5. 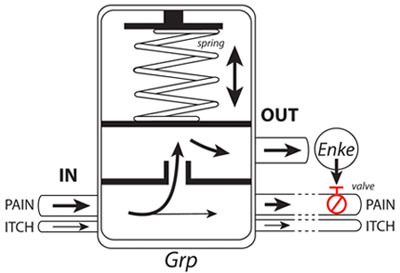 Conceptual illustration of Grp neuron function as a relief valve. A gastrin-releasing peptide receptor mediates the itch sensation in the spinal cord.